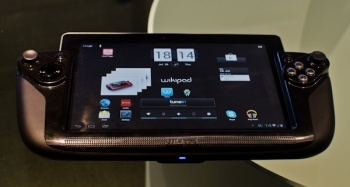 Unspecified last-minute updates delay the launch of android-powered Wikipad past October 31st. If you were one of the ones who pre-ordered Wikipad, the android-powered gaming tablet, brace yourself for disappointment. Unspecified last-minute updates have delayed launch of the tablet, and there's no word of a new release date. "There is a last minute opportunity to enhance the Wikipad bundle," said the Wikipad Team in an official statement on the delay, "as well as a minor refinement needed to ensure our first customers are completely satisfied with the Wikipad." Special bonuses - again, unspecified - will be offered to those affected by the setback. "We apologize for this delay," the Team went on to say, "and want you to know that we are committed to bringing you the very best, high-end gaming tablet possible." The most the Team was prepared to say about a new date is that it will announce one "soon." As to what the minor refinement is that knocked the launch back, only the Wikipad Team knows for sure, but this isn't the first time Wikipad has gone back for a feature tweak. It had originally been intended for a March release, but that got cancelled; then on September 6th the President of Sales faithfully promised it would be out October 31st. So much for faithful promises, but it does make me wonder why the developer made the announcement in September, if there was any significant risk it'd blow the October deadline.